From one of Granta’s Best Young British Novelists, an emotionally powerful, award-winning novel about an outsider haunted by an inescapable past. Jake Whyte has retreated to a remote farmhouse on a craggy British island, a place of ceaseless rains and battering winds, with only her collie and a flock of sheep as companions. But something—or someone—has begun picking off her sheep one by one. There are foxes in the woods, a strange man wandering the island, and rumors of a mysterious beast prowling at night. And there is Jake’s relentless past—one she tried to escape thousands of miles away and years ago, concealed in stubborn silence and isolation and the scars that stripe her back. With exceptional artistry, All the Birds, Singing plumbs a life of fierce struggle and survival, sounding depths of unexpected beauty and hard-won redemption. EVIE WYLD grew up in Australia and London, where she currently resides. 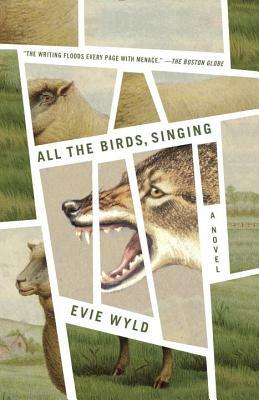 Her first novel, After the Fire, a Still Small Voice, won the John Llewellyn Rhys Prize and a Betty Trask Award, and All the Birds, Singing won the Miles Franklin Literary Award and the Encore Award for Best Second Novel. Wyld has also been short-listed for the Orange Award for New Writers, the International IMPAC Dublin Literary Award, the Commonwealth Writers Prize, the James Tait Black Prize, and the Costa Novel Award, and long-listed for the Baileys Women’s Prize for Fiction.